February 4, 2016 – A NASA team has successfully demonstrated the handling and loading of a Swedish-developed “green propellant” that smells like glass cleaner, looks like chardonnay, but has proven powerful enough to propel a satellite. As part of an international agreement with the Swedish National Space Board (SNSB), the team simulated a flight-vehicle loading operation with LMP-103S Green Propellant at Wallops Flight Facility on Virginia’s Eastern Shore. 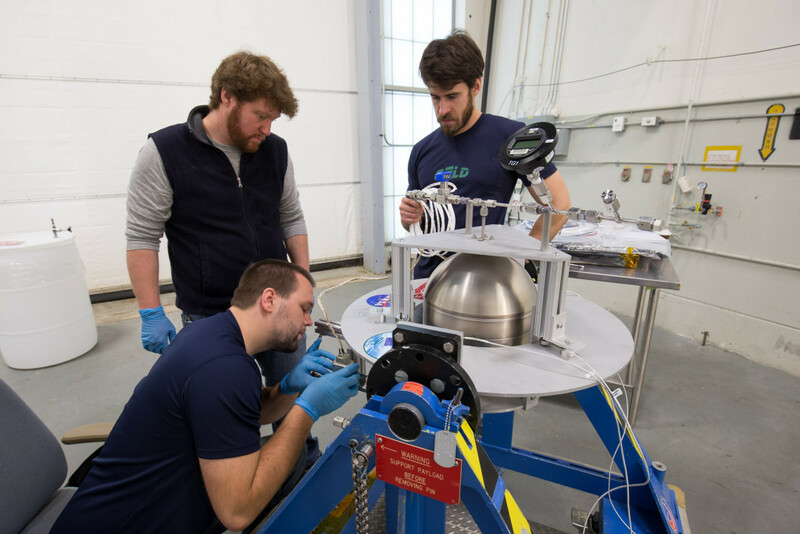 The team demonstrated the proper storage and then loading of the propellant into a flight-like tank provided by the New York-based Moog Inc., an aerospace company interested in green-propulsion technology. This was the first-ever demonstration of its type on a U.S. range, said Henry Mulkey, an engineer at NASA’s Goddard Space Flight Center in Greenbelt, Maryland, who led the effort. The demonstration, which took place late in 2015, will be followed this year by two other tests. Goddard’s Propulsion Branch is carrying out a fracture test to determine the behavior of a flight tank should it crack while loaded with the propellant. And at the end of 2016, the branch also plans to test fire two Swedish-developed spacecraft thrusters powered by LMP-103S, said Caitlin Bacha, associate head of the center’s Propulsion Branch. All tests are designed to show that LMP-103S is a viable, higher-performing, safer, and less-expensive alternative to hydrazine, a highly toxic propellant that requires personnel to don cumbersome, full-body protective gear when handling and loading the propellant into spacecraft. By way of comparison, Mulkey said he mixed LMP-103S wearing just safety glasses and a smock. Over the years, 70 LMP-103S-powered thrusters have been built and used in different applications. NASA’s Pre-Aerosol, Clouds, and ocean Ecosystem (PACE) mission also is investigating the use of LMP-103S-powered thrusters. Goddard’s experimentation with LMP-103S is just part of NASA’s green propellant story. Goddard, as well as a handful of other NASA centers, also is participating in the Green Propellant Infusion Mission (GPIM). GPIM, which NASA’s Space Technology Mission Directorate expects to launch in 2016, will carry 31 lbs. of another green propellant — AF-M315E — developed by the U.S. Air Force Research Laboratory in California. During the demonstration to be carried out by Ball Aerospace & Technologies Corp., of Boulder, Colorado, the spacecraft’s five engines or thrusters will burn in different operations, testing how reliably the engines perform. Aerojet Rocketdyne, of Redmond, Washington, built the thrusters. For its part, Goddard carried out fluid testing on GPIM’s systems and components, Bacha said. In particular, the test team carried out the first-ever “surge” and flow testing on AF-M315E. Surge is a phenomenon that occurs when an isolation valve opens to allow propellant to rapidly fill empty manifold lines. These pressures, if too high, potentially can damage sensitive flight components downstream. Flow testing, meanwhile, reveals how individual components perform in a system using the propellant. No data of this type existed for the AF-M315E prior to Goddard’s surge and flow testing, Bacha said. Although the more traditionally used hydrazine will not be completely displaced due to its long heritage and widespread use, the two green propellants do offer compelling advantages. In addition to being easier to handle, they are more tolerant of low temperatures and could bring about less-expensive, more flexible mission designs. Furthermore, both green propellant options are better performing than hydrazine, meaning that a spacecraft could carry out more maneuvers on one tank of propellant or could reduce the needed propellant leaving room for additional flight instruments.